Not to be confused with Launceston, Tasmania. Launceston is a town near the A30 road in Cornwall, England. In 2001 there were 7,135 people living in Launceston. The parish church is dedicated to St Mary Magdalen. 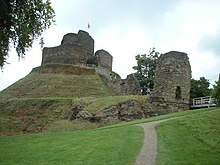 Launceston was the former capital of Cornwall until it was replaced by Bodmin in 1835. Launceston is just over one mile (1.6 km) west of the River Tamar which marks the border between Cornwall and Devon and is often referred to as the "gateway to Cornwall". The Norman ruler of Cornwall built a castle here which is now in ruins.